The text below dates from 2013. It is the previous unpublished version of a paper I presented at the annual meeting of the Sixteenth Century Studies Conference in San Juan, Puerto Rico. At the moment there are no notes with the text. I plan to update the text to include at least a bibliography. The title of the paper I presented in San Juan is “Mennonite Printers, Anticonfessionalism, and the Persistence of Dissent in the Netherlands.” Except for updating the title for this post, I have only edited the text of the 2013 paper very lightly. Part of the reason for publishing the 2013 paper as a blog post now is that my grad student, Brookelnn Cooper, is finishing off her MA research paper, and she is making the case for Colom as the printer / publisher of Menno Simons’ Blasphemy. For more about the Blasphemy, see my post about it here. Recently I have done some limited research in the Netherlands on Dutch Mennonite revolutionaries in the decades just before and just after the French Revolution, but I’ve also been grateful as I work from home in Canada for the great on-line resources available from the Netherlands. I am speaking particularly of the Short Title Catalogue of the Netherlands. To use the Short Title Catalogue effectively I have been applying the method of enumerative bibliography: that is, I have been making complete-as-possible bibliographies of people I am studying and using these to draw inferences and build better research questions for further work. My teacher in this method of drawing inferences from reconstructed bibliographies is none other than Piet Visser, who has already highlighted the method’s value in his 1996 essay: “‘Blasphemous and Pernicious’: The Role of Printers and Booksellers in the Spread of Dissident Religious and Philosophical Ideas in the Netherlands in the Second Half of the 17th Century.” In that paper Piet focuses on Spinoza’s notorious printer, the Flemish Mennonite based in Amsterdam named Jan Rieuwertsz. In a tip-of-the-hat to Piet, I would like to retitle this paper “Blasphemous and pernicious: an early 17th-century prequel.” Over the past year I have been looking at the output of a series of Dutch Mennonite printers and publishers. After a first stage of this work my broad research hypothesis is that from the 16th through the 18th centuries a significant group of these men acted not merely as businessmen out to make a buck but also as intellectual agents out to make a point, shape public discourse, change Dutch society. I’ll say more about this hypothesis by focusing on an early 17th-century Waterlander Mennonite, Jacob Aertsz Colom (1599-1673). He started publishing books in 1622. This of course was only a few short years after the beginning of the Counter-Remonstrant crackdowns in the young Dutch Republic. Colom stands out in this context as particularly noteworthy, because orthodox Calvinists would have had every reason to consider him to be as “blasphemous and pernicious” as they later considered Spinoza’s Mennonite printer. While Colom was active as a printer, publisher and bookseller, I will focus on books that carried his publisher’s mark. There are a few reasons. One is that the mark is noteworthy in itself. It is a fiery column in the sky. This, of course, is a play on Colom’s name, as well as a reference to Exodus 13:21 (from the King James translation: “And the LORD went before them by day in a pillar of a cloud, to lead them the way; and by night in a pillar of fire, to give them light; to go by day and night”). I infer from this mark that he was a bit of a flamboyant figure, a conclusion that I think gains more strength the more we know about his publishing output. A second reason I will focus on works that carried Colom’s publisher’s mark is that these are the easiest to track using my method of reconstructing bibliographies using on-line catalogues. And a final reason is that I think the works that Colom chose to publish allow me to say the most about his role as an engaged promoter of ideas. By my count, Colom produced a total of around 80 volumes over a more than 40-year-long publishing career. This career started in 1622 and reached its point of greatest output in 1630 when at least 10 books came out with his publisher’s mark. He is best-known today as a competitor of Willem Blaeu and Johannes Janssonius in the business of publishing high-quality maps, the first of which he released in his very active year of 1630. I, however, will not be focusing on his maps and atlases. All of his other works are actually my main interest. These works fall broadly into two categories that frequently overlap: 1) literary works by members of Amsterdam’s chambers of rhetoric, and 2) religious writings of a heterodox nature. My initial conclusion is that Colom had a career-long project of giving a voice to authors whose works contributed strongly to combatting the authority that orthodox religious men were claiming in Dutch political and cultural life. I’ll give just a pair of the clearest examples, both taken from the earliest days of his publishing career. My first example is Colom’s first-ever publication, the 1622 release of On the Authority of the Holy Scripture. This is what I believe to have been the first translation published in the Dutch Republic of a work by the 16th-century Polish-Italian reformer Faustus Socinus. To give you a brief idea of just how blasphemous and pernicious this act of publication would have been, I will point out that by the 1650s Dutch clerical and secular authorities had declared the rationalist, anti-Trinitarian vision of Christianity promoted by Socinians to be not merely a heresy but also a civil crime. Colom’s decision to publish a work by Socinus was not a one-time affair. In 1623 he re-released On the Authority of the Holy Scripture, and in the late 1630s he published two more of Socinus’s works. My second example is a play that was one of the results of Colom’s three-year collaboration with the famous Dutch writer of tragedies, Joost van den Vondel. Colom seems to have been Vondel’s primary publisher between 1624 and 1626. In these years the two men released six works together. I will limit my discussion here to Vondel’s 1625 tragedy Palamedes, or Innocence Murdered, a tragedy set in ancient Greece but which contemporaries quickly recognized as a condemnation of the public trial and execution in 1619 of Johan van Oldenbarnevelt. Colom published the play in the spring of 1625, and by December of that year orthodox Calvinist officials who were offended by the play’s political commentary had succeeded in gaining a public order to seize and burn copies of it. This episode shows that both Colom and Vondel were willing to push the boundaries of Dutch public discourse. One possibility, of course, is that the willingness to push boundaries was simply good for business and shows us nothing about the convictions of the people involved. As Piet Visser has pointed out with reference to the later 17th-century career of another Mennonite, namely Jan Rieuwertsz (Spinoza’s publisher), public controversy like this could be a good media advertising strategy. I do not dispute that business interests mattered for many early modern publishers, and Colom too was I’m sure concerned about money. Nonetheless, I am convinced that the publication of Palamedes and selected works by Faustus Socinus are just a few examples of Colom’s chief goal as a publisher: to advocate for dissident ideas and expand the range of acceptable thought and expression during a time of narrowing public, confessional discourse. Because of the limits of time, I’ll give just one more set of reasons why I think this conclusion is a strong one – but there are many more. Most of the literary and religious writers whose works Colom published were advocates of a spiritualistically oriented, non-confessional, even anticonfessional, brand of lay Protestantism. One social centre for Colom to associate publicly with like-minded people was his Mennonite world. For me it’s noteworthy that some of his Mennonite titles were by Waterlander authors, but just as noteworthy is that he also published titles by Flemish and Frisian writers. The overall trend in his Mennonite output again supports my picture of Colom as an advocate of open discourse rather than disciplinary and confessional orthodoxy. Another social centre where Colom certainly met with his authors was the Amsterdam chamber of rhetoric called “The Wild Rose.” Among his contacts there were irenical Catholics such as Jan Hermansz Krul as well as the more famous Dirck Volckertsz Coornhert. Colom published numerous works, both literary and religious, by each of these two men. And now to the skull [a prop I used at the presentation in San Juan just before Halloween 2013 (26 Oct.)]: The example that I think really demonstrates how much passion Colom had invested in a spiritualistically oriented, dissenting brand of Christianity is his long relationship with the religious poet, Dirck Raphaelsz Camphuyzen. On his maternal side Camphuyzen came from an Anabaptist background, and he claimed to be descended from a Frisian martyr. After he was orphaned he had grown up in a Reformed household, and he became a Remonstrant preacher. Camphuyzen died in 1627, soon after Colom began publishing, but they were very likely well acquainted. Camphuyzen was in fact the translator of the first work that Colom published: Socinus’s On the Authority of the Holy Scripture. In 1628, immediately after Camphuyzen’s death, Colom published an edition of Camphuyzen’s Stichtelyke rijmen (Edifying Rhymes), and in the following decades he republished these, as well as publishing a collection of Camphuyzen’s theological works. Colom, it turns out, was a real fan (in the fanatical sense) of Camphuyzen. Some years after the Remonstrant theologian’s death, Colom arranged to collect his cleaned skull from its grave in Dokkum, and he kept this as a memory for the rest of his life. We can certainly find no financial motive here. 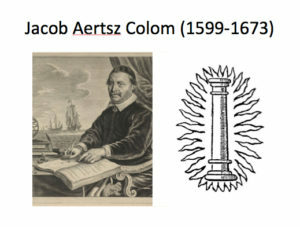 Now for a few conclusions: First, I see Jacob Aertsz Colom as an example of an early modern publisher who (although undoubtedly flamboyant and even a little weird) used his profession to promote an anticonfessional, anti-orthodox brand of Christianity at a time when it was very unpopular. Second, I believe that he (although among a minority) was by no means alone. In future work I plan to highlight the role of further publishers in the 17th and 18th centuries who promoted such ideas. Third and finally, I believe that a focus on publishers using the enumerative bibliographical method will open up a new range of sources for studying dissident, radical ideas in the generations after the supposed end of the Radical Reformation of the 16th century. In other words, although confessional uniformity was a major characteristic of early modern public life, scholars of the so-called confessional era should pay closer attention to the persistence of dissent that I think connected the Radical Reformation with the Radical Enlightenment. A personal research blog on the history of Dutch Ana/Baptists and related groups from the 16th to 19th centuries. For a related group research website, visit http://amsterdamnified.ca. Powered by WordPress | Theme: Radiate Pro by ThemeGrill.